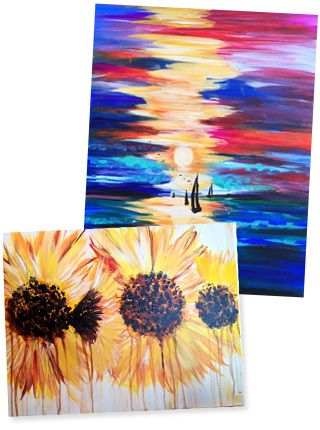 Paint N� Cheers is Creative Social Art. We offer a CREATIVE studio, in which you will feel relaxed and confident while letting your inner artist shine. We offer a SOCIAL, upbeat atmosphere, where you can enjoy wine, music, and the company of others. We offer the studio space and guidance for you to create your own ART masterpiece. First look at our Calendar to see our featured paintings for the month. Pick which painting you would like to learn to paint. Reserve your spot online or by phone. Get ready to paint! Arrive at Paint N� Cheers a few minutes early to get checked in. An instructor will guide you through step-by-step of the featured painting. You will be amazed at the masterpiece you have created!